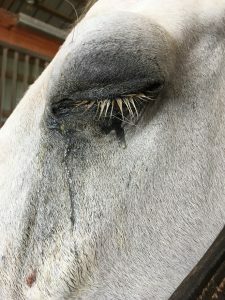 Colic: The most common equine emergency, colic is a blanket term that describes signs of abdominal discomfort in the horse. Signs of colic include: pawing, getting up and lying down, looking/biting/kicking at abdomen, rolling, refusing to eat, repeatedly posturing to urinate or defecate, etc. Our veterinarians will assess your horse via physical exam, and then proceed with further diagnostic procedures and treatments as indicated. 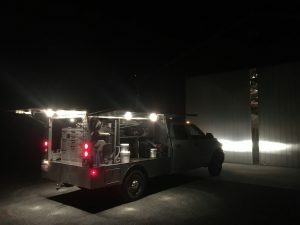 This may include medication and sedation, a rectal exam, passage of a nasogastric tube (into the stomach), and IV catheterization and fluid administration. If applicable, first stop any excessive bleeding. Apply pressure manually or in the form of a wrap, if on a limb, then call the veterinarian. If bleeding is minimal, and it is safe to do so, you may clean the wound with dilute Betadine solution/water to better evaluate its extent. ***Please do NOT apply any oil-based ointments such as nitrofurazone, SWAT, etc. These ointments are intended to keep a wound farther along in the healing process moist and protected, and contaminate a fresh wound, making the veterinarian’s job more difficult and decreasing the odds of a clean repair. 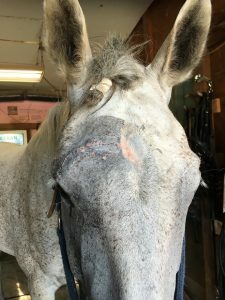 Before calling the veterinarian, it is helpful to note the location of the wound relative to any joints/limb structures, the depth (if possible), and if the wound is old it is useful to take the horse’s temperature, as well. Ophthalmic Emergencies: Eye swellings, changes in eye color, and abnormal ocular discharge are always considered an emergency because significant and/or untreated injuries can result in the loss of sight in a relatively rapid time period. Reproductive Emergencies: This includes dystocia (difficult birth) and signs of colic in the pregnant mare. 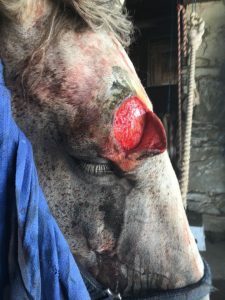 Acute/severe lameness: If your horse is appreciably limping at the walk, doesn’t want to put weight on a limb, or is reluctant to move, it could be an indication of a severe injury such as a fractured bone. Don’t move the horse, stall confine if possible, and call the veterinarian. Choke: This term in the horse does not refer to blockage of the airway, as it does in humans, but rather blockage of the esophagus. If untreated, it can progress to pneumonia from aspiration of food particles and permanent damage to the affected areas of the esophagus. The most common signs of this problem are food-colored discharge from the nose, excessive salivation, and coughing associated with eating/drinking.